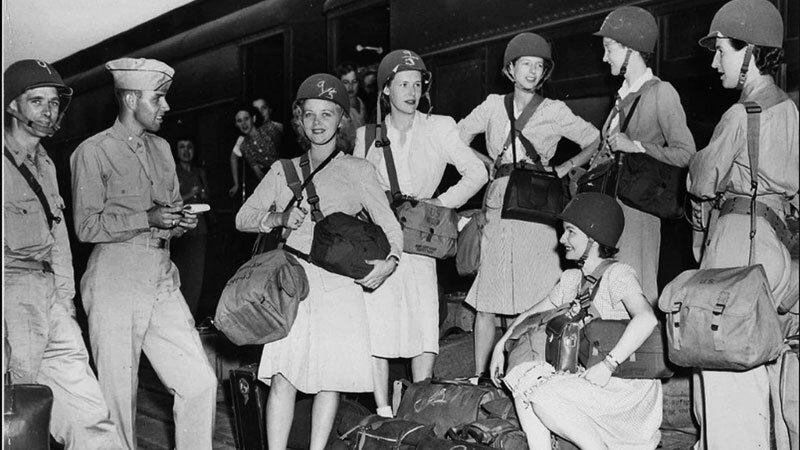 War correspondents and personnel of the Office of Strategic Services, including Virginia Stuart (fourth from left), leaving from Camp Patrick Henry, in Virginia, to go overseas in July 1944. Before the Central Intelligence Agency, there was the Office of Strategic Services — a clandestine espionage organisation of almost 13,000 Americans who, from 1942 to 1945, gathered intelligence for President Roosevelt and wreaked havoc against the Axis powers in every World War II theatre. While an ideal O.S.S. recruit was famously described as “a Ph.D. who can win a bar fight,” the staff were diverse in their backgrounds. They came in as academics, military personnel, scientists, athletes, filmmakers, farmers and even some convicts; they served as spies, cartographers, forgers and propagandists. They broke code, planted false information to mislead the Germans and parachuted into enemy territory to blow up bridges and rail lines. One third of them were women. Their ranks included Marlene Dietrich, the actress, and Margaret Mead, a pioneering anthropologist. Julia McWilliams, later known by her married name, Julia Child, cooked up shark repellent. Jane Wallis Burrell went on to become one of the first C.I.A. operatives killed in the line of duty. Thousands of others broke barriers and demolished stereotypes without ever seeking recognition. Marion A. Frieswyk, now 97, was the C.I.A.’s first female intelligence cartographer and is the last surviving member of the original O.S.S. mapping division. 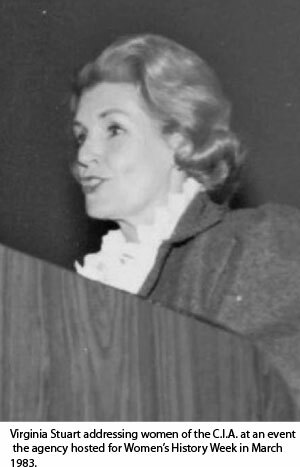 Virginia Stuart, also 97, worked for the O.S.S. Secret Intelligence branch in Washington, Italy, Egypt and China. These are their stories from 75 years ago, being shared publicly for the first time. In November 1943, armed with a bachelor’s degree from Skidmore College, I joined a group of women sworn to secrecy. Before I entered “Q” Building — an unremarkable structure along the Potomac River, where the Kennedy Center stands today — all I knew about the Office of Strategic Services was that it was doing classified war work and it had a job for me. I grew up sailing in Rhode Island and reading about the famous adventurer Capt. Irving Johnson. I dreamed of joining him as a mate on one of his 18-month voyages around the world. But the world was at war, as were most young American men I knew. My older sister, Edith, who had studied chemistry, joined the Navy and I applied to do the same — only to find that they weren’t so interested in liberal arts majors. My father suggested I call his friend working on “some government thing” in Washington, in case he knew of any leads. He did, and following a series of interviews where discretion and diligence seemed to matter more than a long résumé, I met my new supervisors, Margaret Griggs and Evie Barnes, along with a war widow, and a fellow recent college graduate, Jean Wallace. (I wouldn’t learn until later that Jean happened to be the daughter of Vice President Henry Wallace.) Everyone had a specific job to do, and Evie and Margaret set the tone: Work hard, find a way to get the job done and don’t talk about it, ever. The women who managed the registry of the O.S.S. Secret Intelligence branch were like air traffic controllers for classified reports and documents pouring in from O.S.S. field agents across Europe, Asia, Africa and the Middle East. We sweated through our blouses opening, logging and moving along every parcel that secure couriers delivered to our door. We were fueled by cold Cokes from the cafeteria and the understanding of the urgent nature of the reports we were receiving — intelligence on German troop movements, secret radios, plans for penetration and weapons requests from O.S.S. agents behind enemy lines. The amount of communications to be sorted and processed grew at a staggering rate, to match the intensity and scale of the global conflict. We didn’t stop to ask whether something was a woman’s job or a man’s job. We did the best we could with what we had, sending most documents along to the indexing unit, another group staffed entirely by women. Much of the material was top secret. Documents marked “eyes alone” triggered a different protocol — a swift jog to a designated colonel in his office. It was a strange relationship — men and women whom we only knew by code name were relying on us. Delays or breaches could blow their cover, with the most disastrous consequences. When I learned that the O.S.S. was sending women overseas, I told my supervisor, “Whenever and wherever there’s an opportunity, I’ll go.” She put my name on the list, and after eight months in the registry in Washington, I got the good news: they had a spot for me in Cairo. In the summer of 1944, three weeks before my 23rd birthday, I boarded a Navy ship at Camp Patrick Henry in Virginia. There were two other O.S.S. women with me. We wore long-sleeve dresses, khaki, so we would blend in with the 5,000 troops on our ship, which was also carrying some Red Cross workers and correspondents. We knew not to tell anyone about our work. If asked, we’d just say, “I work for the government” and change the subject. We came ashore in Naples, and I was pressed into service at the O.S.S. stations there and in Bari for a few weeks before the commanding officer in Cairo got wind of it and summoned me over. Flying over North Africa on an Army plane, I peered down through the ashy sky and studied stretches of tank tracks — the sandy footprints of the gruesome desert warfare. The war had since moved out of North Africa and into Greece and Italy, though Egypt remained O.S.S. headquarters for Middle East operations. Nothing could have prepared me to see Cairo for the first time. On the ground, I stared out the window of the military truck trying to absorb the variety of costume, cultures and modes of transport, from overcrowded trolleys to jeeps to horse-drawn carriages. The veranda of Shepheard’s Hotel was a daily convention of British, French, Turkish, Yugoslav and Italian officers gathering military, political and economic intelligence. Conversations in dozens of languages mingled with the cacophony of trucks, scooters and mules. Cairo was the crossroads of the world — a kaleidoscope that was always changing. The O.S.S. field station was a converted villa with a code room in the basement. On the third floor, I found a square room piled with international newspapers and back issues of Life magazine interspersed with a hodgepodge of dispatches gathered from personnel in the region. It was a different registry from the one I’d known in Washington, but with the help of an enlisted Army soldier assigned to me and the procedures I’d learned from Evie in Washington, we got a system in place. Men and women came in and out all day, stopping by when they had a question or were looking for reference materials or secret reports. A year later, I flew over the hump to land in Kunming, China, for my next assignment. Within a week, the news reached us: America had dropped the first atomic bomb on Japan. It was cataclysmic, but we couldn’t get any details at first. Who the hell knew what “nuclear” was? As word of Hiroshima flashed across the world, O.S.S. commandos parachuted behind the lines in Manchuria to liberate the Japanese prisoner of war camps.